In 21 pages of closely written entries in a slim 8″ x 10” notebook, undertaker Thomas Murray (1774-1840) listed the names of those he buried. This partial record of interments at Boston’s earliest Catholic burying ground, St. Augustine Cemetery, was kept by Murray during a six-year period beginning in 1833. The newly-digitized document can now be viewed online. Prior to the establishment of St. Augustine Cemetery in the then-newly-developing neighborhood of South Boston, the remains of Boston’s Catholics were interred in cemeteries not consecrated by the Church. Boston’s first Bishop, Jean-Louis Cheverus (1768-1836) established St. Augustine Cemetery with the support of Augustinian priest Fr. Philip Lariscy, who raised the money for the project. When Cheverus’ dear friend, Rev. Dr. Francis Matignon, died in September, 1818, the cemetery was not yet opened, and Matignon’s body was kept in a tomb at Boston’s Granary burying ground. Three months after his death, Matignon was interred at St. Augustine Cemetery in a service presided over by Cheverus. Remains of other area Catholics were also moved to the new cemetery, whose mortuary chapel was dedicated July 4, 1819. The oldest extant Catholic church in Massachusetts, St. Augustine Cemetery Chapel is now part of Gate of Heaven-St. Brigid parish collaborative. St. Augustine Chapel, St. Augustine Cemetery, Dorchester Street, South Boston, Suffolk County, MA. 1933. Historic American Buildings Survey, Library of Congress. The fragile pages of Murray’s record list names and ages in chronological order, beginning in October 1833 and ending with Murray’s own death. Some entries identify places and causes of death, or include additional notes such as “city poor,” “alms house,” or “house of industry.” Names of parents and spouses are occasionally identified, and sometimes information about payment is recorded. The locations listed are primarily street addresses, but also include neighborhoods, or towns and cities outside Boston. One notably frequent location, “Cregys,” is Craigie’s Point, a neighborhood in East Cambridge. Hospitals and other institutions are mentioned – along with the occasional schooner or railroad. It is the city’s waterfront neighborhoods, particularly the North End, whose addresses dominate the record. Reading death records from any time period is a grim experience, and examination of these is no exception. One confronts disease (typhus, cholera, croup, fits, whooping cough) and many types of accident. The names of the ledger’s dead are almost entirely Irish and their ages rarely exceed fifty years. Infant and child mortality is plainly evident. Stillborn children are entered with a parent’s name. The locations of the burials are recorded as grave numbers (4, 11, etc.) or by owner’s name (“Collins grave,” “Cain’s grave,” “my tomb”). Detail of ledger page including the burial of Ursuline nun, Sister St. Henry (Catherine Mary Quirk), October, 1834. Thomas Murray Family Papers (MS2000.017). In primarily Protestant Massachusetts in the early 19th century, assimilation of Catholic immigrants wasn’t without conflict. In August, 1834, a mob of anti-Catholics in Charlestown (now Somerville), rioted and burned down Mt. Benedict, a school for girls operated by nuns of the Ursuline order. One nun who endured the violence, Sister St. Henry, died of tuberculosis a few months after the destruction of the school. She was buried at St. Augustine, and is included in this record. Burns also has a small collection related to the school. Born in Dublin, Ireland, in 1774, undertaker Thomas Murray arrived in Boston in 1810 and became a naturalized American citizen in 1814. He was sexton of St. Augustine Chapel and Cemetery from the time they were established. He also owned a Catholic bookstore in Boston. Murray married Margaret Murphy in 1821 in a ceremony officiated by Bishop Cheverus, who would become a close friend of the family, and for whom the couple named their first son. The Murrays lived in South Boston and had six children. The undertaking ledger is just one part of a larger collection of Murray family material held at the Burns Library. 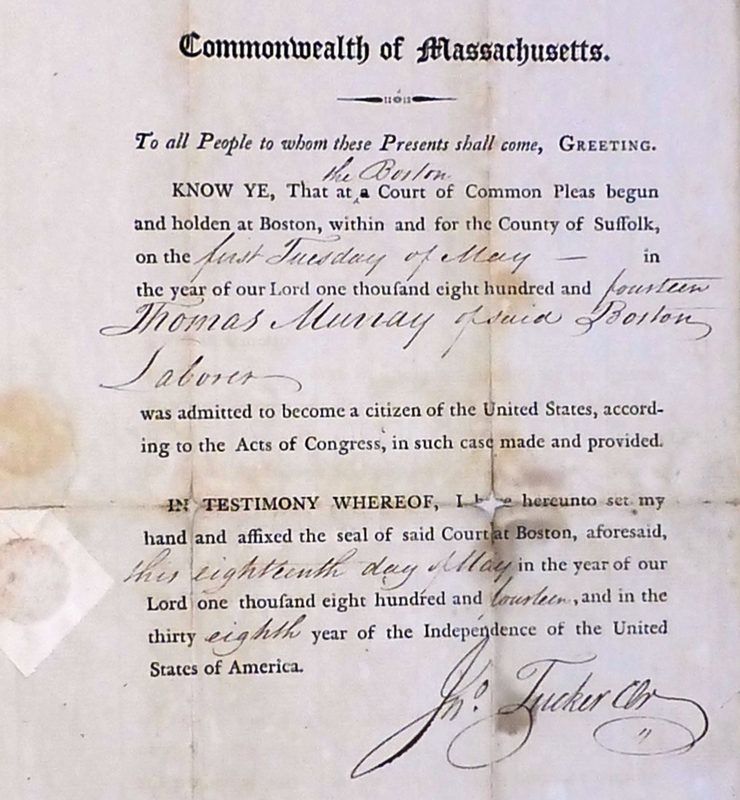 Detail of Thomas Murray’s naturalization certificate, 1814. Thomas Murray Family Papers (MS2000.017). The Archdiocese of Boston Archives holds other records of St. Augustine cemetery, including burials, 1850-1859; lot sales, 1840-1859; copies of gravestones, 1819-1850; and a list of graves copied from original records, undated. The website Find A Grave includes over 740 entries associated with the cemetery. Deaths in the Murray ledger are also represented in copies of Boston death records available online. The long and interesting story of St. Augustine Cemetery and Chapel, including their place in South Boston history, their deterioration, renovation, preservation, and – most importantly – the people connected to them, is documented in many sources and publications. The John J. Burns Library is happy to add this record to them. Elizabeth Hayward collection of Ursuline Academy materials. MS2011.027. John J. Burns Library, Boston College. Roman Catholic Archdiocese of Boston Records, 1789-1900. Massachusetts, Town and Vital Records, 1620-1988. Archdiocese of Boston Archives. Cemetery Records. Catholic TV. Catholic Destinations: St. Augustine Chapel and Cemetery. Fannin, Minxie J. History of Saint Augustine’s Chapel and Cemetery. With Leslie Larson. Boston: 1989. Gate of Heaven and St. Brigid’s Parish, St. Augustine Cemetery Chapel. Historic American Buildings Survey. St. Augustine Chapel, St. Augustine Cemetery, Dorchester Street, South Boston, Suffolk County, MA. Massachusetts, South Boston, Suffolk County. Documentation Compiled After 1933. Library of Congress. O’Connor, Thomas H. Boston Catholics: A History of the Church and Its People. Boston: Northeastern University Press, 1998. O’Dwyer, George F. Stone Inscriptions in St. Augustine’s Cemetery, South Boston, 1819-1900, copied by George F. O’Dwyer, Lowell, Mass. For Boston Athenaeum, 1926? MSS.S87. Boston Athenaeum. Ryan, Andrew. Written in a City Churchyard. Boston Globe. May 28 2017. South Boston Historical Society, and St. Monica-St. Augustine Parish. Fact sheet. Thomas Murray Family Papers. MS2000.017. John J. Burns Library, Boston College. U.S., Find a Grave Index, 1600s-current. Saint Augustine’s Cemetery, South Boston, Suffolk County, Massachusetts. This entry was posted in Archives & Manuscripts, Staff Posts and tagged Archdiocese of Boston, cemeteries, Church Buildings, Historic Buildings, South Boston, St. Augustine Cemetery and Chapel, undertaking, Ursuline Convent. Bookmark the permalink.